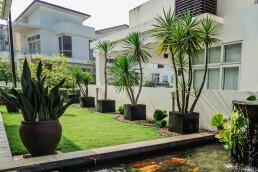 A well-designed landscape can be inspiring. It can boost your spirits and give you solace. 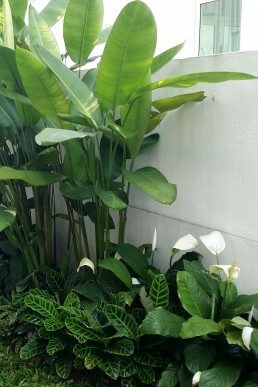 A beautiful of indoor or outdoor landscape can also improve the curb appeal of your home and inspire other people. It provides a choice of experience, for everyone, depending on the individual themselves. 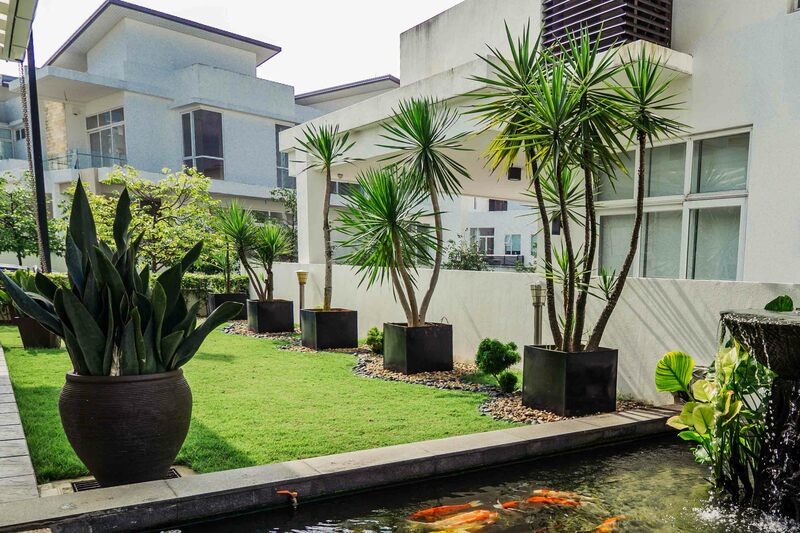 At SeriGreen, we deliver landscapes that are focused on creativity & practicability. Nature, by design is a very beautiful thing & your lawn and landscapes, in a sense, is an extension of who you are. 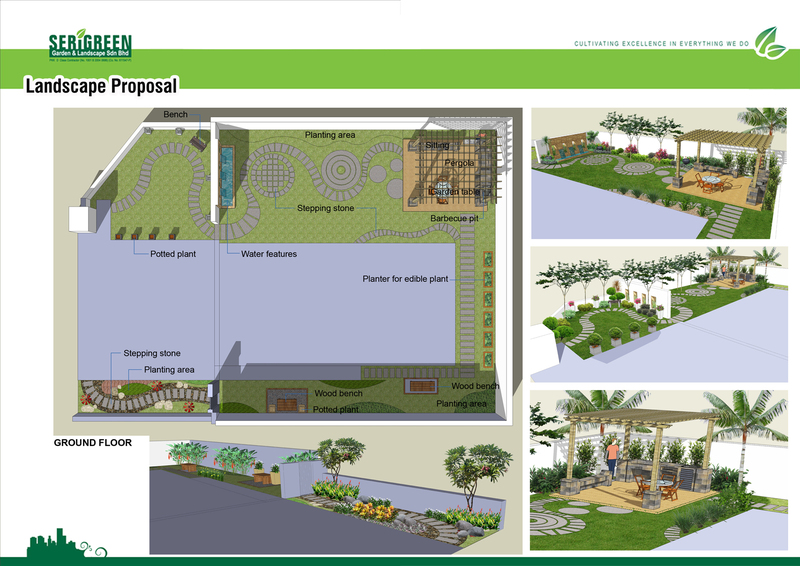 Express your personality and interests through the design of your landscape & garden. We intensify gifts from nature and combine them into any style that you desire. From your desire, we will fuse a mix cocktail of nature’s expansive palette of colors, textures scents and compositions into one cohesive beautifully designed landscape. 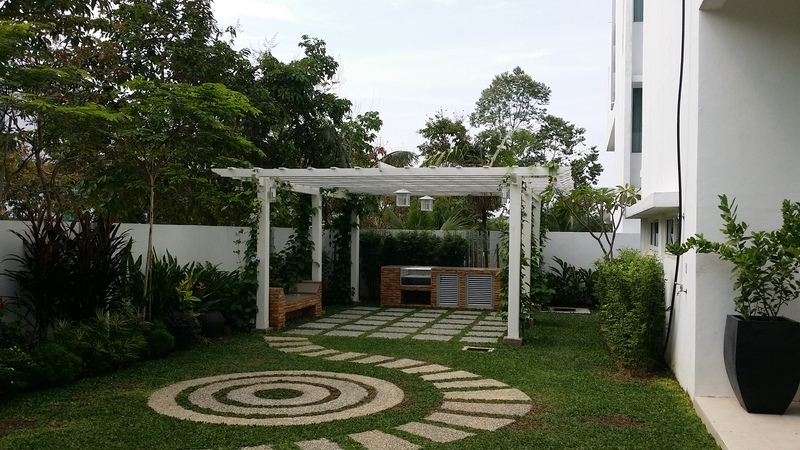 We have skilled and talented Horticulturist & Landscape Architects that are able to guide and consult you in delivering the best by steering the client to the suitable plants, materials and garden layouts for achieving their goals and dream. If you ever need help to realize your idea, bring us in early in the project. That way, we can help everything work as an organic whole. Your contractors or architects will appreciate it, and the final outcome will be something that you will be very proud of. Evaluating original design and planning specifications, exploring other alternatives, or even planning for future expansion, are just some of the things that we highly recommend to start before breaking ground. You can even give us a call if you just need a second opinion. We’d love to hear from you. We operate strictly according to our standard operating procedure that complies ISO 9001:2008 quality management standards. Even so, we’re flexible. We don’t just build according to the specifications & numbers that’s printed on a plan. We observe budget carefully. We know each site is unique. We let the personality of the area speaks for themselves. We incorporate corporate culture of a company into a commercial projects and the personality of the owner in a residential projects. Combining the area’s personality with the corporation or individual’s personality will ultimately create a place that it’s uniquely unique. 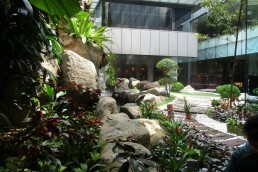 Hardscaping refers to the solid, hard elements in landscape design that stay the same for years. For these reasons, hardscape features are the ones that we start with as they lay out the boundaries and shape of the area. Examples of hardscape features include: walkways, driveways, patios, swimming pools, fountains, stone benches, arbors, gates, heavy materials like stone, flagstone & rock. 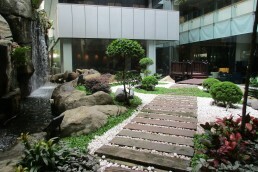 SeriGreen collection of experts in diverse fields consistently designed hardscape masterpieces. We can help you realize your vision for a perfect landscape using hardscape designs incorporated into the layout. Whatever your dream space looks like, we can help you achieve it. When the hardscaping is complete, it’s time to add the living part of the landscape, which is the softscape. 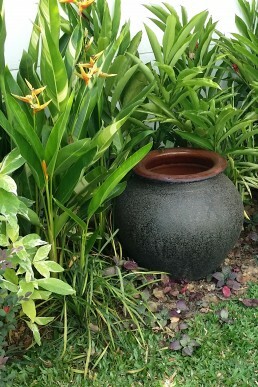 Softscape features may be permanent, such as evergreen trees and shrubs, or they may be temporary, such as with perennial flowers. This is what makes softscaping so much fun, as it’s always changing to fit the your vision. Examples of softscape features include: grass, trees, shrubs, flowers, soil, vegetable gardens. Whatever the project calls for, SeriGreen will bring in trusted specialists. We believe that the diverse skills & disciplines being offered by our people will ultimately fit together to create a better beautiful total. Horticulture is a branch of agriculture which mainly deals with the reproduction of plant life. 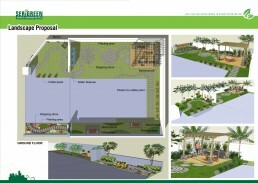 It involves the management and cultivation of gardens and land. While this career is similar to a landscape architect, there are fundamental differences between the two. They conduct research in gardening and landscaping, plant propagation, crop production, plant breeding, genetic engineering, plant biochemistry, and plant physiology. Their work particularly involves berries, fruits, nuts, vegetables, flowers, trees, shrubs, turf, and soil management. 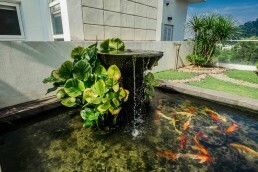 In landscape architecture and garden design, a water feature is one or more items from a range of fountains, pools, ponds, cascades, waterfalls, and streams. With the design of landscape gardens and houses being evermore unique & personalized, the exciting new trend has been the open-minded use of water feature design. 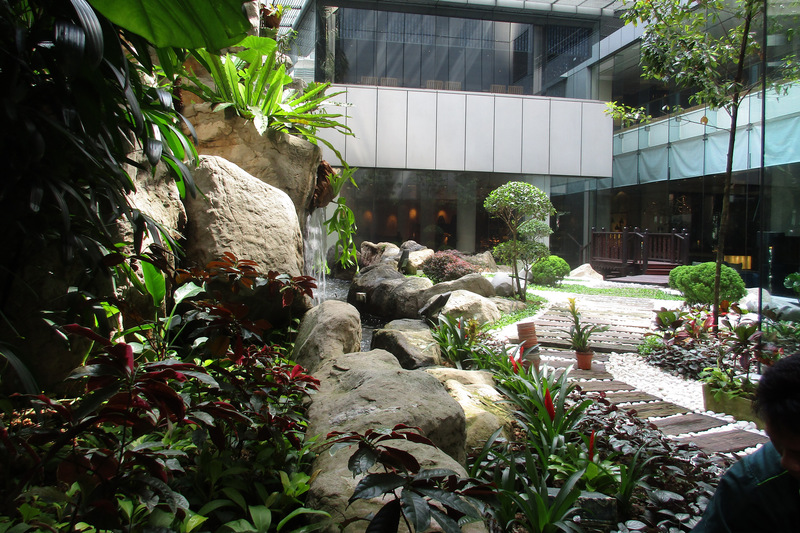 We don’t just consider the placement of the water feature, we want to create the perfect ambiance and how they fit into the overall design. With our diverse expertise in different materials, hydraulic engineering, water chemistry and understanding of water dynamics, SeriGreen offers huge flexibility in the designs that we can offer, ultimately fulfilling and achieving your aspirations. You have an idea of what you are planning to build, but you have no idea how much to budget for it? We can help you create a concept plan, and help you pick the material, types of plants and layout that will fit your need.